Eating disorders are often misunderstood as an obsessive desire to be thin in order to be more attractive to others. While it may begin this way, eating disorders are complex and when one drills down to better understand what drives this behavior in a person, we find that it actually has very little to do with food or weight. Rather, the eating disorder has become a way of coping with painful and difficult feelings or experiences that are hard to talk about or even put into words. So, in fact, the eating disorder is the “red flag” that there is something much deeper that needs to be addressed. Eating disorders have the highest mortality rate of any psychiatric illness. That’s a scary thing when you’re trying to fight bulimia nervosa on your own or if you have a loved one who is struggling with bulimia nervosa. Due to the secretive nature of this particular illness, it can be difficult for others to realize how much you are struggling or to help someone you love. 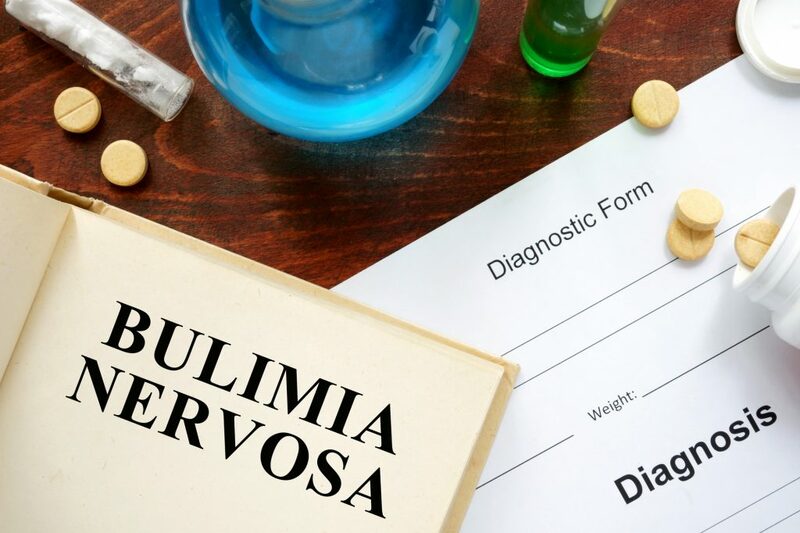 Here, we’re breaking down the essentials of bulimia nervosa and everything you need to know about bulimia nervosa treatment. This entire process is commonly referred to as the binge-purge cycle, which is the most commonly recognized characteristic of bulimia. It is important to note that one does not have to vomit (purge) in order to receive a diagnosis of bulimia. Any behavior used to compensate for the binge eating is considered a sufficient for a diagnosis of bulimia. Bulimia is distinct from other eating disorders in that it is defined by the presence or absence of the binge-purge cycle. The majority of bulimia cases are the purging type, which includes the binge-purge cycle previously outlined. In the non-purging type of bulimia, which is less common, the individual will use fasting or excessive exercise to compensate for binge episodes, rather than vomiting or laxatives. This makes them seem to be closer to anorexia patients, though the presence of binge patterns makes them bulimic. Because of the nature of the disorder, bulimia does have a few symptoms in common with other eating disorders. Bulimia and related behaviors can also create major strains between the sufferer and their family and friends, especially if their abnormal eating behaviors lead them to avoid certain social situations. While the exact causes of bulimia are unknown, the research indicates that a combination of genetic, environmental, psychological, and socio-cultural factors lead to bulimia. For each person, there is generally a combination of factors that come together, a perfect storm of sorts, that leads to the development of bulimia. It can be difficult to diagnose bulimia in men because they are less likely to purge, which is the easiest behavior to identify with bulimia. Men may present themselves as “binge eaters,” not realizing that the behaviors they use to compensate for the overeating are also a part of the problem. Men may be more likely to compensate with fasting or exercise, rather than purging. This is not to say that men do not use purging. Many men who wrestled as teenagers, for example, report that they learned to purge as a means of “making weight” for a wrestling match. Regardless of whether the sufferer is male or female, or the specifics of their case, bulimia comes with serious health complications. A big area of concern is mental health, as bulimia is often combined with other mental illnesses, particularly anxiety disorders and major depressive disorder. It also often coincides with substance abuse problems. In addition, bulimia has a catastrophic effect on your physical health, which is often masked by the fact that bulimia patients often aren’t as dangerously underweight as anorexia patients. One of the biggest concerns is cardiovascular health, as binge-purge behaviors disrupt the body’s ability to regulate the cardiovascular response to stress. This often leads to arrhythmia and, in severe cases, can result in cardiac arrest. If you or someone you love is suffering from bulimia nervosa, it is vital to pursue bulimia nervosa treatment. This can feel very frightening, especially if you’re discussing behaviors that you’ve kept hidden for a long time and challenging the deeply rooted fears behind those behaviors. But pursuing bulimia nervosa treatment is vital to recovery from bulimia, and it is the first step in saying that you are worthy of living a happy, healthy, fulfilling life. Treatment can take the form of residential treatment, partial hospitalization, intensive outpatient, or a less intensive treatment avenue. Regardless of the type, the goal of bulimia nervosa treatment is to break the binge-purge pattern and restore a healthy relationship to food and your body. Because of this, psychotherapy is the most common component of bulimia nervosa treatment. Second, family therapy can also be used to address relationship problems and dynamics within the family that may be exacerbating the eating disorder. Because bulimia is often combined with other mental health disorders, medications such as antidepressants are often used alongside psychotherapy. To be clear: medications are not intended to act as a magic Band-Aid for bulimia. Instead, they are intended to create additional support that will help you better cope with difficult situations. As such, it’s important to examine all your options before trying medication. Some people meet diagnostic criteria for major depression or anxiety disorders but find that these symptoms are manageable without medication once their eating disorder is under control. Others may find that they need the extra boost that medication provides in order to reduce obsessive thoughts, compulsive behaviors, rigid beliefs, or other symptoms that make it extra challenging to utilize new, healthier coping strategies. Taking medication is a very personal decision, one that requires thought and discussion with qualified professionals. It is not unusual for individuals to take medications while they are working towards recovery. Once they are better, it may be possible to taper off your medications. For others, it may be a longer time. Whatever the case may be for you, what is important that you do whatever is necessary to get into and stay in recovery. If you think you need bulimia nervosa treatment, we’d like to start by congratulating you. You made it to this page, which means you’re acknowledging you need help, and that’s an important first step. You don’t need to take the remaining steps alone. Click here to start exploring what the recovery process looks like. If you’re ready to start the process of recovery, let’s talk. You deserve to live a life that’s not held back by your disorder, and we want to help you get there. Have any questions? I’d be happy to answer them. Simply reach out to me and I’ll be sure to answer anything you want to know.